This instruction from May 6 spoke to me. With exactly one month in the books working at Coastal Carolina University I have tried to take this attitude into the office each day. I think what makes this instruction so valid is that it addresses things we can control. While others around me and extenuating factors will contribute to my success, when it all comes down to it the results regarding CCU Social Media start and end with me. Each day I am trying to do all I can to make the university look good on a social level, go above and beyond the job I was hired to do, and follow through on the vision and promises I made to the people who hired me. I am results-driven and every single day I am putting myself on audition. I really want to impress. But while I can’t say with 100% certainty that I will deliver on the results in the way that they should be delivered, I know that I can maintain my character day in and day out. Each morning when I wake up in beautiful Myrtle Beach I have the choice to act in a way that will recognize, inspire, and help others or act in a way that is counterproductive. I choose the former. One month down and I am so happy that I am in this position at Coastal Carolina. I want to be the absolute best employee possible and bring honor to this university that has given me a life changing opportunity. 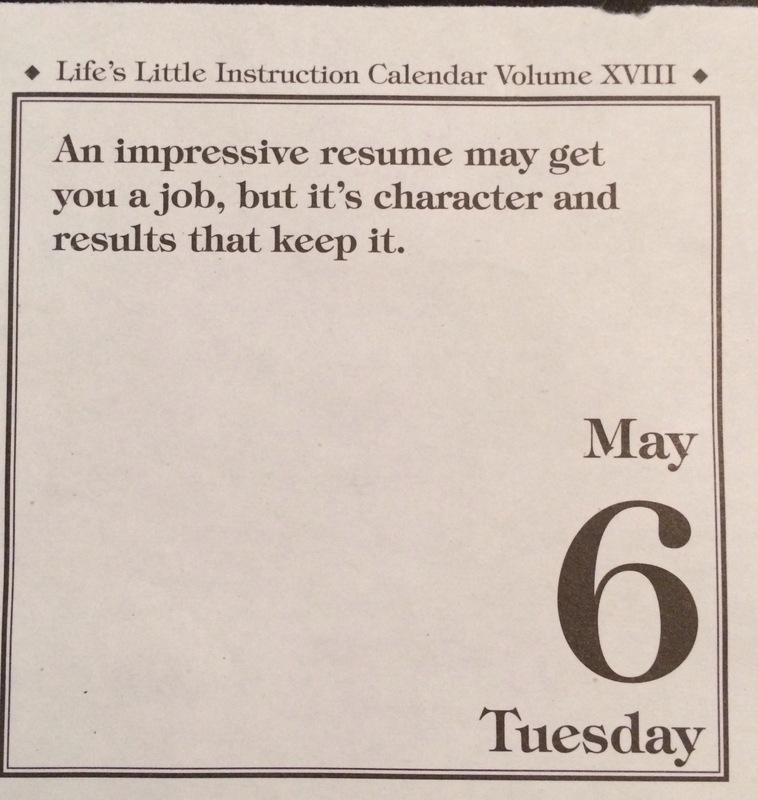 If I remember to deliver the two things this instruction mentions, results and character, I know I will do just that. Don’t Blink. With the weekend almost here I don’t think there is a better way to celebrate than to write another rapid topic, random blog post. Sound good? Okay! Here are five things you probably don’t care anything about. 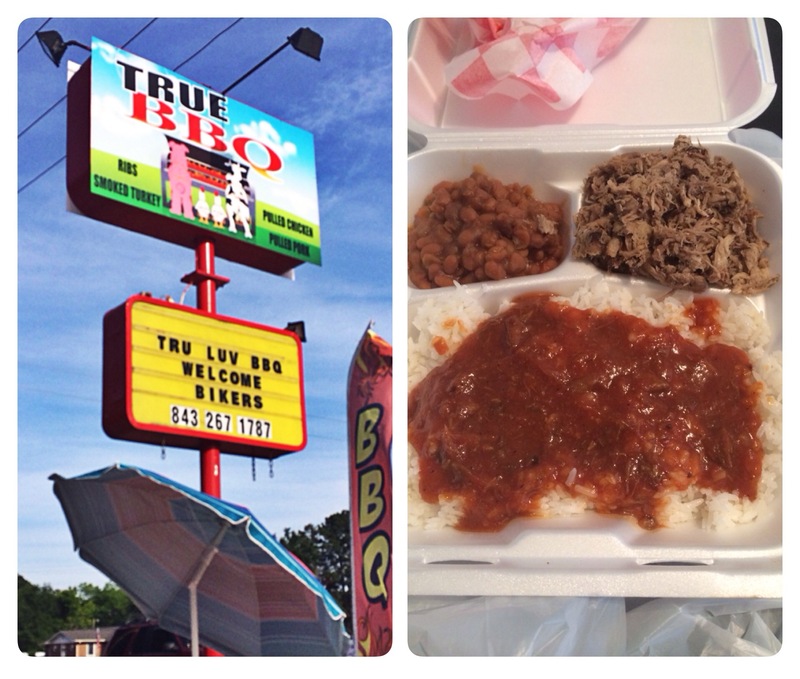 Side of the Road BBQ: This past weekend I fulfilled my dream to eat at a hole-in-the-wall, sketchy southern BBQ joint. For the past couple weeks I have noticed a small shack-like structure on the side of the road during my commute to work. I knew I wanted to hit it up sooner than later. This past Saturday night I pulled up to True BBQ and parked in a diagonal lot several feet away. I then went up to the hut, looked at the paper menu taped onto a window, and told the girl inside what I wanted. About ten minutes later she presented me with a heavy Styrofoam container of BBQ. I came home and pigged out. I got the pulled pork plate and for my sides I chose baked beans and a dish I had never tried before called rice and hash. It was delicious! If there weren’t so many other restaurants around here that I need to also try I would say I would be back real soon. This place was good. The sign is on the left and my delicious dinner is on the right. Great Time to Start at Coastal: I joke that I carefully selected my start date at Coastal Carolina University. To start it all off my first day was on a Thursday, making it a very short work week. I came right at one of the most exciting times on campus, graduation. Then just a week after I arrived summer hours took effect at CCU, a glorious thing where we get off at 1 p.m. on Fridays. To top it off, this past Monday we celebrated Employee Appreciation Day. After a ceremony in Blanton Park (beautiful green area on campus) we were treated to a delicious lunch of hamburgers/hot dogs, chili, cole slaw, baked beans, chips, and desserts. What a great first month at CCU! 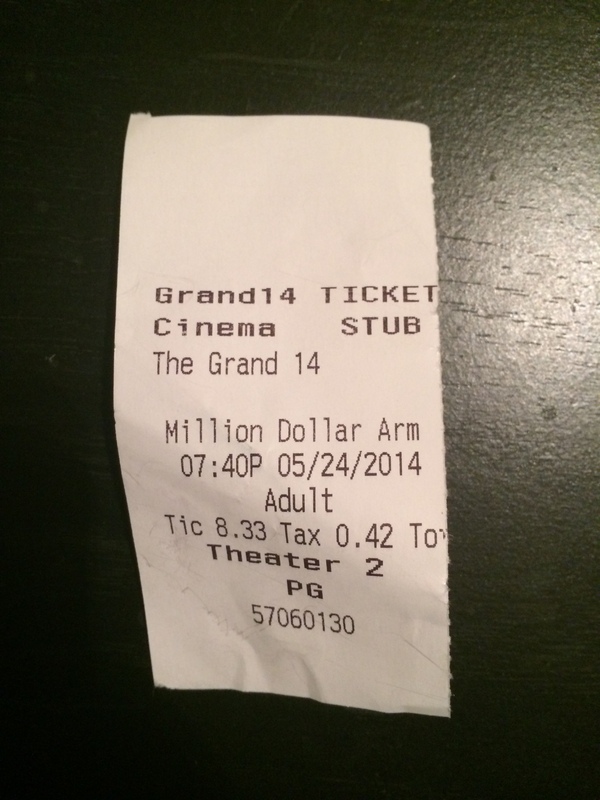 “Million Dollar Arm”: Recently I saw my first movie at the theaters in Myrtle Beach. My friend Sidney and I went to the Grand 14 Cinema in Market Common. We watched “Million Dollar Arm” and I must say I really enjoyed it. Typical Disney inspirational sports movie but the whole plot is very interesting and a couple of intriguing acting roles helped to make the movie a winner. You will laugh, cry, and root for the characters involved. A movie is always a little bit better when it is based on a true story, and “Million Dollar Arm” is. Proof that I actually went and saw the movie. Extreme Weather: You can’t beat the weather in Myrtle Beach. Sun, sun, and more sun….except for brief instances. 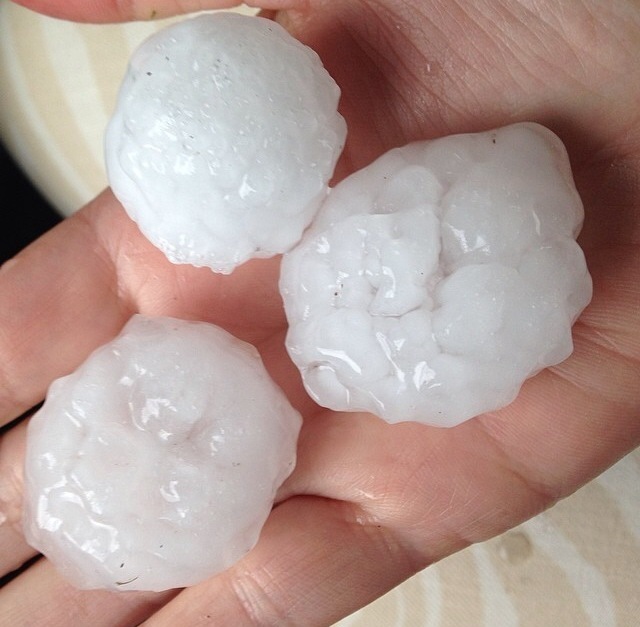 Last Friday the sky opened up and we received golf ball-sized hail. In my lifetime I have heard the term “golf ball-sized hail” but never experienced it nor seen it. Although not all the chunks were that large as you can tell from the picture below some of them were. Amazing that my car didn’t get dominated. As I sit here right now the National Weather Service is warning about a powerful thunderstorm that is about to come through. Looks like a night indoors for me! I had never seen hail this big before. NBA Playoffs: I want to see a Pacers-Thunder Finals but most likely I will get the exact opposite. Although it was a little gratifying to see Indianapolis defeat Miami last night it is unlikely that the Pacers will win two more to win the series 4-3. I am just so sick of Lebron James. The Erik Spoelstra interviews get old too. And I won’t cheer for any team that has Birdman on it. In the west I am pulling for Kevin Durant’s team and I am looking forward to Game 5 tonight (series is knotted at 2-2) but I just have a feeling that the experience and poise of the Spurs will eventually win out. If someone made a deal with me and said they would guarantee that one of my teams would make the Finals I would definitely choose the Pacers. I would much rather see the Spurs representing the Western Conference than seeing the man behind “The Decision” and his team rep the east. Besides the terrible writing that post wasn’t too bad, was it? Have a great weekend, everyone. Thanks again for your support of this blog and please know I am always open to suggestions and criticism. Don’t Blink. It’s a Bird…It’s a Plane…It’s a QUADCOPTER!! One of my last nights spent out west found me in the driveway of my parents’ house in Spokane. 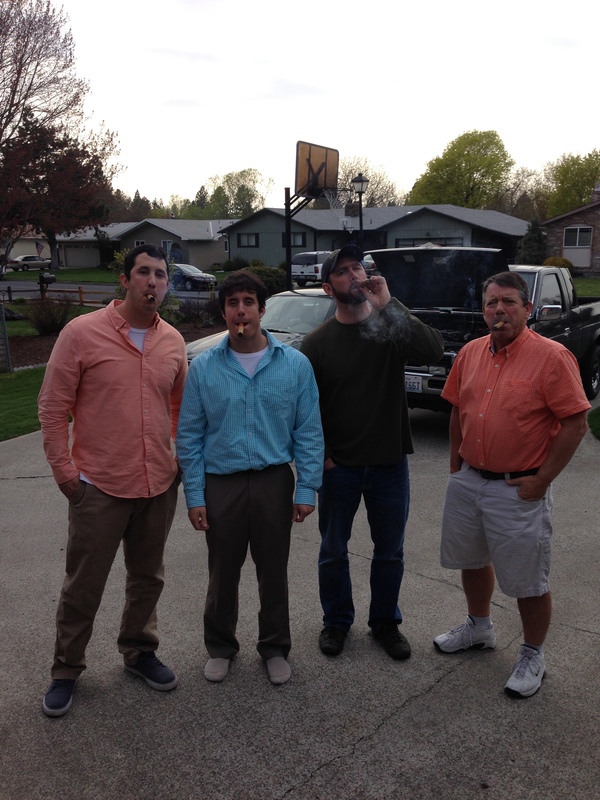 It was the early evening of Easter Sunday as my dad, brother, and I watched my sister’s husband play with his new toys. Puffing on cigars we watched Jay use his thumbs to manage the remote control he held in both hands. We all got a pretty good kick watching the device that he was controlling. It was a relaxing Easter evening. Never since that Easter had I seen a quadcopter before. That night I saw two as Jay brought both of his treasured gadgets over to the Reser residence for some flying time. For those who don’t know, quadcopters are drones. They are tiny machines that fly high in the air, manipulated by a person with a remote control on the ground. My dad, Glen, and I watched as Jay put on an exhibition of sorts. He shot it way up into the sky at fast speeds. He sent it across the street to the playground at the park where kids stopped playing to look up. He entertained the people out for a Sunday stroll who stopped at the edge of our driveway to marvel at the small aircraft and ask questions. He made the neighbor dog go absolutely nuts by hovering the craft over his head, just slightly beyond his out of control leaps. 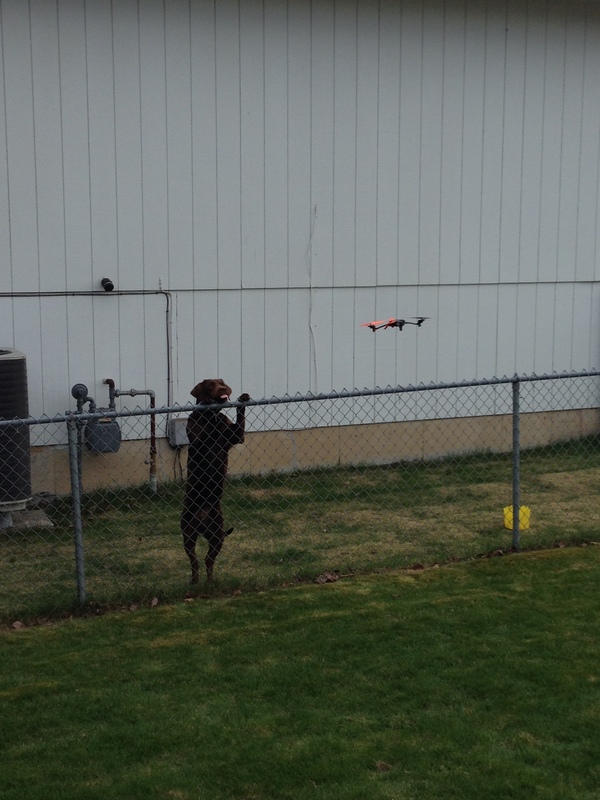 The dog, named Kokanee, went ape over the quadcopter. I enjoyed the show and thought the things were pretty cool. However as I moved across the country the quadcopter display became a long lost memory…until recently. Last week as I walked across campus I passed our video team having a great time flying around their own quadcopter. Although they all had smiles on their faces they weren’t merely taking the drone for a joy ride. This model came equipped with a camera and they were using it to make a sweet aerial video showcasing the Coastal Carolina campus. When I saw the finished product this week I was amazed at the quality, beauty, and height of the footage. Say goodbye to the necessity of rounding up a helicopter and crew to go airborne, things are now much easier. 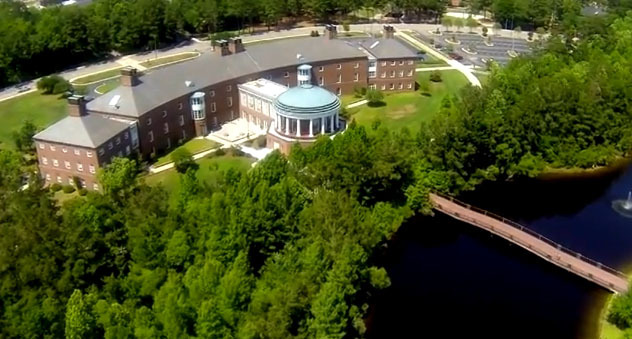 A look at our beautiful campus here at Coastal Carolina University from a quadcopter. Coincidently this Sunday I became exposed to yet another use of drones. In an “Outside the Lines” report I learned that many football teams at the college and high school level are now using the machines to take practice video. It goes without saying that evaluating formations and player performance from up above is advantageous. With the recent easy availability of quadcopters combined with the flawless images recorded by them why wouldn’t you use the technology? Well because there are legal ramifications. But that is not for this blog post. It is worth noting though that this potential stumbling block has also made sporting teams think twice about using them as part of the gameday experience. Crazy to think that normal civilians used to not have access to drones. The military enjoyed exclusivity with the technology but no more. The masses now have their hands on them and it is improving both how we have fun and how we shoot video. Talk about a win-win. Don’t Blink. Last week I ate lunch in our conference room with Martha Hunn, our Director of News and Public Affairs. While chatting she brought up a challenge that she faced in her life that I battle with on a much smaller scale. Before accepting her position at Coastal Carolina, Martha worked at WBTW, a local news station here in Myrtle Beach. Throughout her time as a very popular news personality she spent a portion of her tenure anchoring the morning show. While she loved doing that newscast she had a constant worry in the back of her head. Martha’s fear was oversleeping. As anyone remotely familiar with morning shows can attest to, the hours are obscure to say the least. Rising at 2:30 a.m. to get dressed, commute, and then prepare for a 5 a.m. or 5:30 a.m. show is not easy. Doing it on a consistent basis makes the possibility of oversleeping greater. Martha explained to me that despite going to bed early, she never really got a good night’s rest during those morning show years. The paranoia of somehow oversleeping and leaving the station without its morning anchor terrified her. Because of this her sleep was choppy and she would awake several times during the night. I too struggle with not letting the thought of a possible alarm clock malfunction or a deep sleep mess with me. I definitely have a fear of oversleeping. I get up at 5 a.m. each morning to go to the gym. For me missing a session at the rec pretty much seals the deal that the day will be a complete disaster so I put a lot of stock in making my workout. But as 5 a.m. does come early and I have to really push myself to get to bed before midnight I do worry about oversleeping. It is on my mind constantly. I pretty much have just accepted the same symptoms Martha dealt with. When I lay my head down on the pillow I am prepping myself to jump out of bed in five hours. Once I finally fall asleep I am back up again an hour later, then another hour later, then another hour later, etc. I check my clock to make sure it is not 5 a.m. yet and then check my phone just to confirm. I set my alarm for 4:50 a.m. to give me a ten minute window to fully wake up before jumping out of bed before the clock can read 5:01 a.m. I like to think I am Cal Ripken Jr. with a long streak of not missing an early morning session. With that type of pressure it makes me extra obsessive over not oversleeping. Flights, early morning weekend activities, and 7:30 a.m. Sunday mass also strike fear in me about possibly sleeping too long and screwing everything up. Because of my nerves when it comes to oversleeping I go through the same routine of going to bed with a paranoid conscience and waking up throughout the night. Here is my question: Is there a name for this? I am sure a lot of people besides Martha and myself have dealt with it. Although I would like to relax myself a little more I don’t necessarily think it is a 100% terrible trait. It just means that we are committed and serious about making our obligations. I am a perfectionist and I can’t have any wrinkles at all in my day, especially not right off the bat. So it is almost 12:30 a.m. here in Myrtle Beach and as you all know I got a 5 a.m. (well, actually 4:50 a.m.) wakeup call coming my way. Time to hit the hay and get some rest before another great day tomorrow. Don’t Blink. I knew Myrtle Beach was the golf capital of the country but I didn’t know it was the putt putt capital too. My new town boasts tons of spectacular miniature golf courses. But don’t call them miniature golf courses, I got straightened out real quick by the locals. It is putt putt. As I was saying, the courses here are insane. Think “Happy Gilmore” style courses. They are all beautiful, inviting, themed properties that will make you smile. Since arriving here in the area I have had every intention of conquering some of the courses. Well, four weeks since rolling into town I finally got the opportunity last night. Last night my friend Sidney and I visited the Mt. Atlanticus Minotaur Goff course. My friend Sidney and I went to the Mt. 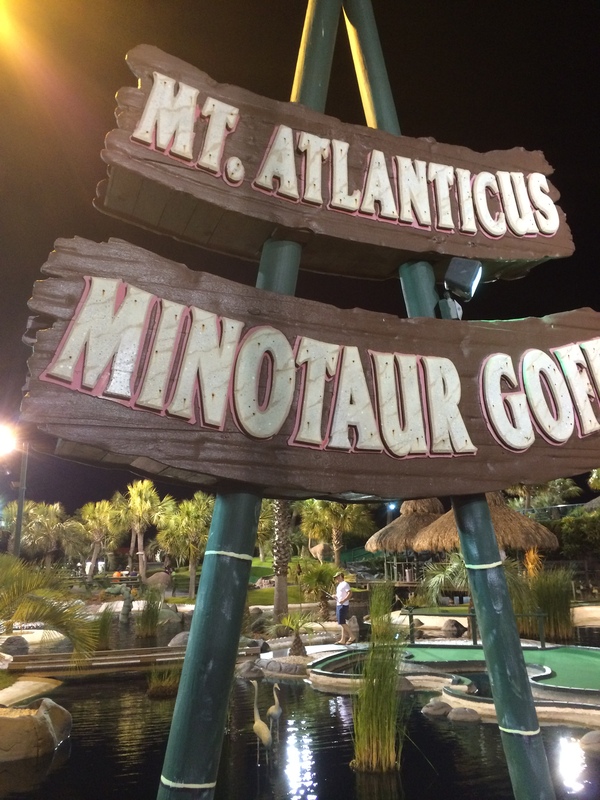 Atlanticus Minotaur Goff putt putt course on Sunday evening. Couple things right off the bat that differentiate putt putt here in South Carolina from miniature golf in the west. Here, because of warm weather, the game is played primarily in the evening so courses stay open late. Interestingly, these places have higher quality lighting systems than most Major League ballparks. Also, the properties themselves have a couple different courses to play and many of the individual holes themselves have different variations to choose from. You might think that because these courses are out of this world the price to play might be too. Complete misconception. Sidney and I both played for a total of $14. The Mt. Atlanticus course blew my mind with its beauty. Water surrounded most of the greens. Cool animal sculptures awaited you all over the place. Palm trees and other lush green vegetation grew everywhere. I was definitely playing the coolest eighteen holes of putt putt golf I had ever enjoyed in my life. A dragon in the water! Since the course was built to resemble a mountain, it slowly took us up in elevation from hole to hole. Although it seemed like we would only go up a few stairs every other hole or so it really added up in the end. By the time we reached the eighteenth hole we had a gorgeous view from up high of the whole course. From there we had to descend about six different flights of stairs to reach ground level again. The view of Mt. Atlanticus from the 18th hole. The creativity of Mt. Atlanticus was so cool. On one hole if you successfully putted your ball into a stream of water it would take it for a windy ride and sure enough drop it in the cup. The 19th hole (ball return) challenged you to smash your ball across a skinny strip of green while avoiding the sparkling blue water on either side of it. I saw sand traps for the first time ever on a mini golf course. Straw huts lined the course and housed several holes. A waterfall gushed out of the rock structure. 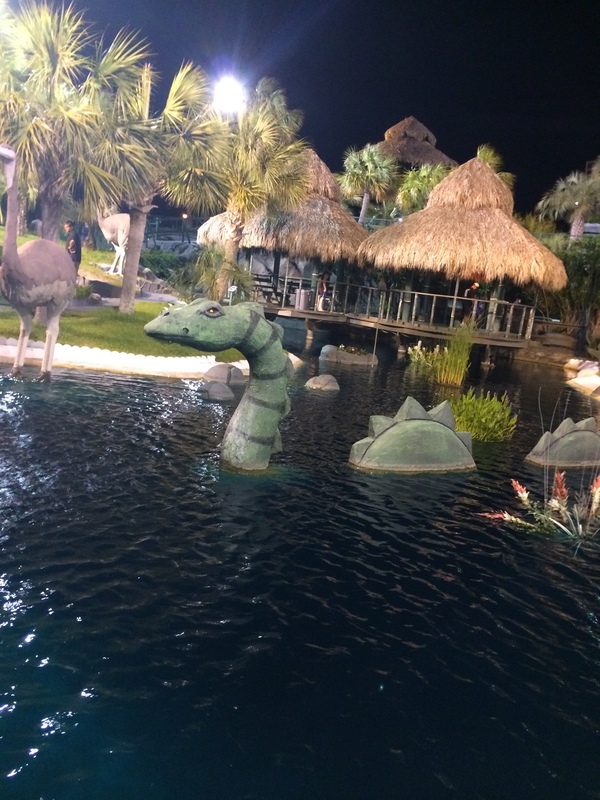 Playing the course at night on a beautiful late May evening gave me a wonderful first experience with putt putt in Myrtle Beach. Sidney and I had a great time playing putt putt. Sidney and I had a blast. After a week of buildup on who would beat who we finally got to settle it on the course. At the end of eighteen competitive holes I came out on top with a slim two stroke victory (wait…was I supposed to let her win?). Call me a little kid but playing putt putt last night might have accounted for the most fun I have had in a while. I am already looking forward to the next course I get to play and the creativity I will see. 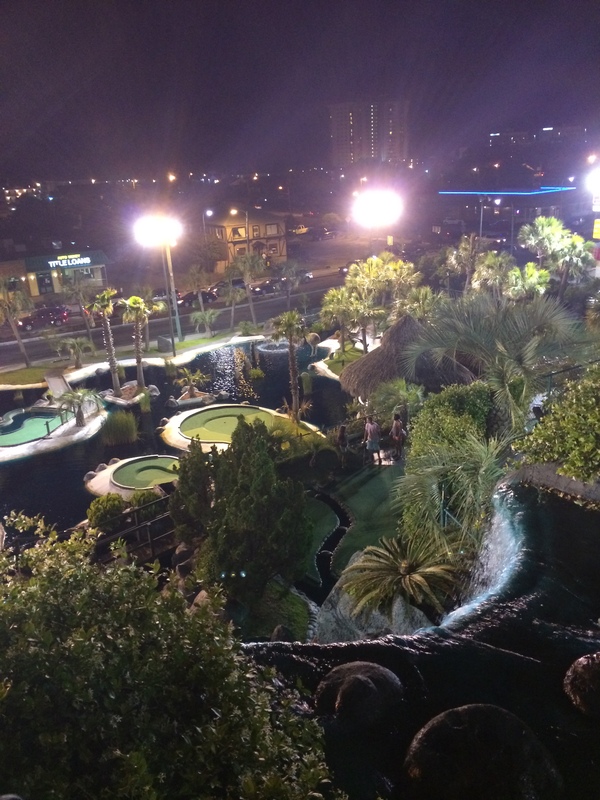 Myrtle Beach does miniature golf….um I mean putt putt….the right way. Don’t Blink. Music has a way of helping us remember the times. We all have songs that take us right back to a certain event, period of time, or maybe even to a piercing feeling or a strong smell. I hear songs that take me immediately back to my senior year of high school, my first Vegas trip in 2008, the 2009 Griz football season, a failed relationship, Fourth of July 2012, lazy days at the pool in the summer of 2013, and so on. Music defines memorable experiences for us. Moving to Myrtle Beach has definitely resulted in a significant and memorable moment in my life. In the almost four weeks I have called this beautiful place my home I have started a new job, experienced a different way of life, met new people, and gotten a feel for what it is like to live almost 3,000 miles from everything you once knew. A few songs will forever remind me of this major transition period for me. This song, along with the song I mention underneath this one, are the two that I have heard the most in my time here. I will hear it twice on my drive to the gym in the morning (switching between stations), once at the gym, two more times on my drive home, and then again if I go anywhere else that night. For Pete’s sake on Sunday night Luke Bryan even performed it at the Billboard Music Awards. By this time the words “Play it again, play it again, play it again” are cemented inside my head. As I mentioned I have heard this song A LOT. Just like with Luke’s song I hear it multiple times a day. But it is all well and good because it is a nice narrative song with some clever lines. The imagery is great too. Adding on another similarity with the song above it also talks about young romance with the guy sharing a unique experience with the girl. When I hear this song twenty years from now I will think about entering the HTC gym doors at 6 a.m. as it has greeted me more than once the minute I have walked into the facility. Just hearing the intro to this song will transport me to the start of my adventure in South Carolina. Also the way Evans’ elongates the word “down” (think doooooooooooooooooooown) will always stick in my mind. The lyrics themselves also kind of hold some meaning to me in my specific situation. Although Evans is singing about a relationship I connect to them in a different way. With so many changes happening so quickly for me with the move sometimes it felt like I could have called out “Slow Me Down” a time or two. Do the lyrics “It was our first week at Myrtle Beach, where it all began” say enough? Although I don’t particularly care for this song that much and even though it isn’t even that new I have seemed to hear it a crazy amount of times down here. As with the Sarah Evans song the lyrics also seem to address my situation. Even though I don’t necessarily want to rewind anything (I am very much a forward thinking person) it does make me realize that if I did go back just a month or two I would be rewinding to a much different time in my life with a totally different job in a totally different state with totally different friends. So I will put these songs on a playlist and title it “The Myrtle Beach Beginning.” Or maybe I won’t. By this time I am so sick and tired of these songs that I don’t know if I want to hear them again. But I do know that down the road when one of these songs sneaks up on me it will take me straight back to a very big time in my life. Don’t Blink. Okay, there is one thing you have to know about me: I really like peanut butter sandwiches. I like peanut butter sandwiches so much that for the past five years I have ate one for lunch pretty much every single work day. With the exception of going out to lunch once in a blue moon or opting for something else because I forgot my PB sandwich at home I would not hesitate to say that 99% of my work day lunches have consisted of a peanut butter sandwich. This little quirk of mine has drawn attention from my co-workers. At Montana people would check in on me and mockingly (still good naturedly of course) ask if I had my sandwich that day. Before anyone would offer me anything if someone brought in a shareable lunch item they would preface it by saying “Now I know you have your peanut butter sandwich but would you like to try some…?”. On my birthday my former boss gave me a loaf of bread and a couple jars of peanut butter as a present. 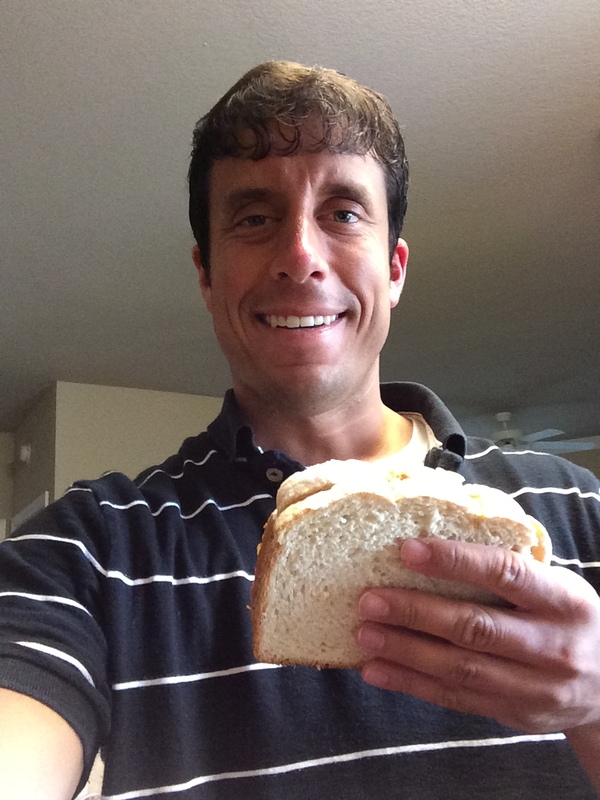 When I arrived at Coastal Carolina and I brought out my green container with my peanut butter sandwich while informing my new co-workers about my constant lunch fare I am sure they wondered who they had hired. But they have had fun with it as well. Believe it or not, the sandwiches I make here in Carolina taste just as good as they did in Montana. I eat a peanut butter sandwich for lunch every single day. Let me answer the two questions I get asked most often: No, I do not use any jelly or jam. 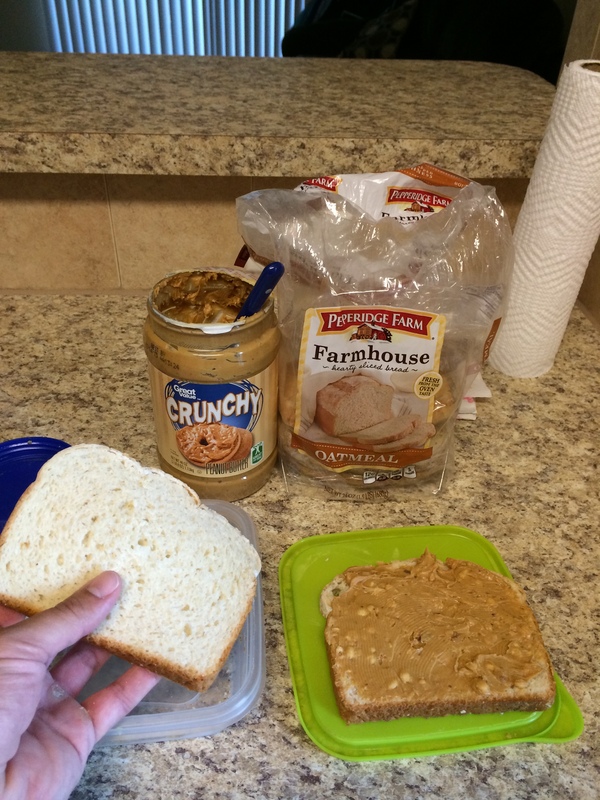 I eat plain peanut butter sandwiches…just the bread and the peanut butter. And no, I actually don’t have a preference when it comes to peanut butter. When I go to Wal-Mart I buy whatever is cheapest. Usually it is their generic Great Value brand but sometimes there is a sale on Jiff or Skippy so I opt for either one of those. For the longest time I would just eat the peanut butter sandwich for lunch and that was it. I would use that as my own personal excuse to go crazy gorging myself at dinner that night. But since I have arrived at CCU I have started to add a bag of chips or Cheez-Its to my menu. Here at my new work I take full advantage of my one hour lunch. Whereas at Montana I would work out during the noon hour and then throw down my sandwich in two minutes at my desk I actually socialize here. Sometimes I eat with the graphics guys in one of the cafeteria type places on campus or sometimes I eat in our conference room with other co-workers. It is hard to make a peanut butter sandwich stretch an hour so that is why I have added on the chips (and I still overdo it at dinner). I make my peanut butter sandwich the night before. You might be wondering how this got started. I don’t really even know. I grew up eating plain peanut butter sandwiches. I love peanut butter itself in general. When I entered the workforce and I wanted to save money it just made sense to buy a loaf of bread on Sunday and have it last me through the week. I don’t tire of items very easily and I still look forward to my PB sandwich every single day. One thing I should point out is that I make a pretty mean sandwich. I don’t go light on the peanut butter so that helps hold me over until dinner time. Call me a little kid but I enjoy my lunch choice. Sure it is boring and sure it is not the most nutritious item ever but it works for me and it allows me to not worry about lunch plans. Oh yes, while the type of bread and brand of PB can fluctuate there is one thing that always stays the same…I only eat crunchy peanut butter. If you try to tell me that the creamy version is better we most likely can’t be friends. Always look forward to your lunch! Don’t Blink. Although I have only lived in South Carolina for just over 20 days it has given me enough time to observe the way of life and culture down here. While I have said more than once that in general people are people wherever you go, different regions do have certain personalities, brands, and quirks. For tonight’s blog post I want to briefly describe five things that are distinctively southern and five things that are distinctively western. Accents: When I watched movies with southern characters I used to think they purposely exaggerated the accents. They didn’t. Southern people speak with an accent, some more than others, but I love the sound of it. There are certain words that sound absolutely awesome when rolled off the tongue of a southern person. Phrases: With the accents come the phrases too. The word “ya’ll” isn’t a stereotype of the southern language, it is a word near and dear down here that is used constantly. For the most part everything is “Yes Sir” and “Yes Ma’am.” Many women will address people with words such as “hun,” “baby,” or “darling.” The word “Coke” is a catch-all term for any type of drink. Give me three more weeks and I will have another list of terms to rattle off for you. Food: I would say food is a big difference for me coming from the west. Seafood is king down here, especially in the area I am living. In the past week I have tried grits, hush puppies, and sweet tea. The south is famous for BBQ and so predictably there are a lot of restaurants specializing in it. Surprisingly I have also noticed that there are many mom and pop wing places down here. I am embarrassed to admit that I haven’t dined at any of these local places but have managed to visit Buffalo Wild Wings twice. As I mentioned in a previous post, you will find alligator on some menus. Corn Hole: It took me my first full day in Myrtle Beach to realize how popular corn hole is out here. For my western friends asking what corn hole is just think of a bean bag toss type game. You will find people playing this on the beach, in pool areas, at bars, or at any social event. When I attended the Finals Frenzy night at CCU I watched as two teams almost ended up brawling with each other because their corn hole match got so heated. This game is not for the faint of heart. Mt. Dew and Peanuts: Today I was walking to lunch with our media relations and publications editor and he filled me in on one of his favorite drinks. Explaining his concoction he told me he will occasionally take a bottle of Mt. Dew and pour a pack of peanuts (shell off) into it…and then drink it! I posted this very unique recipe on Twitter and received a few responses back telling me that this is a completely southern thing. Never in my wildest dreams would I ever have thought to mix something like that up. Coffee Shops: The other day at lunch I had to explain to our director of news and public affairs about the millions of independently owned drive up coffee stands that line the streets in the western states. With my boss helping me out, we explained the size of such a stand by comparing it to an ice shack here in the area (yes, in South Carolina they offer places you go just to pick up ice). I explained how people develop loyalties to such stands and how many of these places now operate under themes such as baristas in bikinis or baristas dressed in zombie makeup. You definitely don’t find Java Huts or the Daily Grind down here. Annunciation: My friend Sidney and I talked about her southern accent for a few minutes. I then asked if I sounded different to her. She said I did sound different because of the fact that I didn’t have an accent. She said I annunciated my words almost to a fault. That is pretty much the consensus from southerners on how westerners talk. Cold Weather/Snow: Just like I have very little idea of how bad the humidity will impact me down here, southerners don’t know too much about the bitter cold we face out west. When I tell people that I left Montana when there was still snow on the ground their jaws drop. When I follow it up by telling them that Missoula saw snow just this month their jaws drop even further. I don’t really even get into the negative twenty below temperatures we “enjoyed” this past winter. I just say that the south beats the west when it comes to weather. More Health Conscious: I could probably put Missoula up against any place in the nation when it comes to the importance of fitness and love of the outdoors so the south doesn’t need to feel bad that I am putting the west ahead of it when it comes to the role of exercise in everyday life. You don’t see people running, riding bikes, walking dogs, and hiking down here like you do in the west. You don’t see the elaborate organic and healthy eating displays either. When I enrolled in my benefits package I was told premiums were higher than back where I am from simply because I now live in an area that specializes in the production and consumption of the tastiest (and not low-fat) food you will find anywhere. Grocery Stores: I could have used this point under the south heading too but the west category needed one more so here it is. Co-workers asked me what grocery stores I shopped at out west. After I threw out the names of Albertson’s, Rosauers, and Safeway they looked at me with blank stares. You won’t see any one of those down here. Rather the main players are Food Lion, Piggly Wiggly, and Kroger. Definitely some changes to get used to but nothing to rattle me too much. In fact, all of these differences just make this new adventure in my life even more fun. I love experiencing new things and life in the south has provided me with that. However, despite what people tell me, I am 99.9% sure I will never develop a southern accent. Don’t Blink. I am due for a multiple topic, random blog post so that is what you will get tonight. But to make things a little more interesting I have a theme for tonight’s five item selection. So not to insult your intelligence I will just let you see for yourself instead of explaining the very elementary thing I am doing. Enjoy! Timehop – My brother alerted me to this app a couple weeks ago and I must say it is pretty slick. With Timehop every day is #ThrowbackThursday. It gives you a summary of what happened on the current date going back several years. It pulls information from Facebook, Twitter, Instagram, and your camera roll to give you a great inside look at what you were doing one, two, three, four, or even more years ago on that date. For a guy like me who has every day of my life recorded in journals since the seventh grade this app is right down my alley. 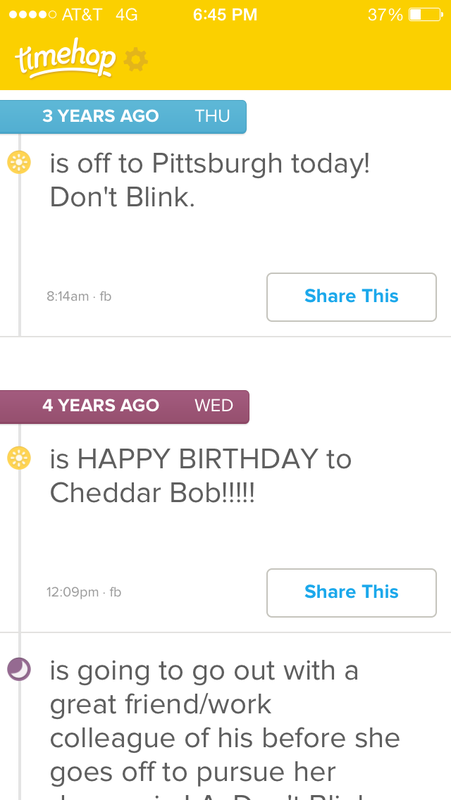 Here is a sample of what my Timehop report looks like for today. Turtles – A really cool thing about the campus at Coastal Carolina University is that it has real turtles! Believe it or not a pond sits in the middle of campus and living in it are tons of turtles. They will come right up to the edge of the water and hang out. Most of them have a reddish-orange mark on their heads and the student body has kind of adopted them as an unofficial mascot. I personally like the little guys. 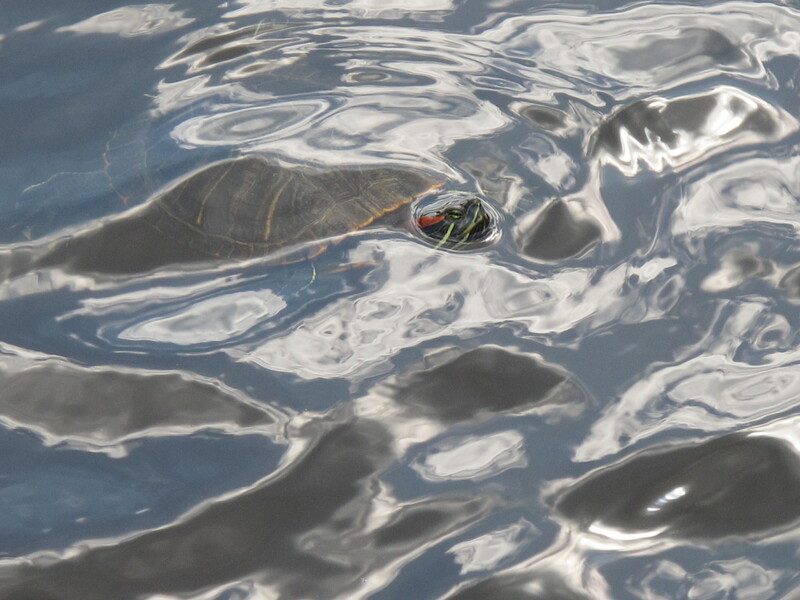 I took this photo of one of the turtles in the Wall Pond at CCU this afternoon. 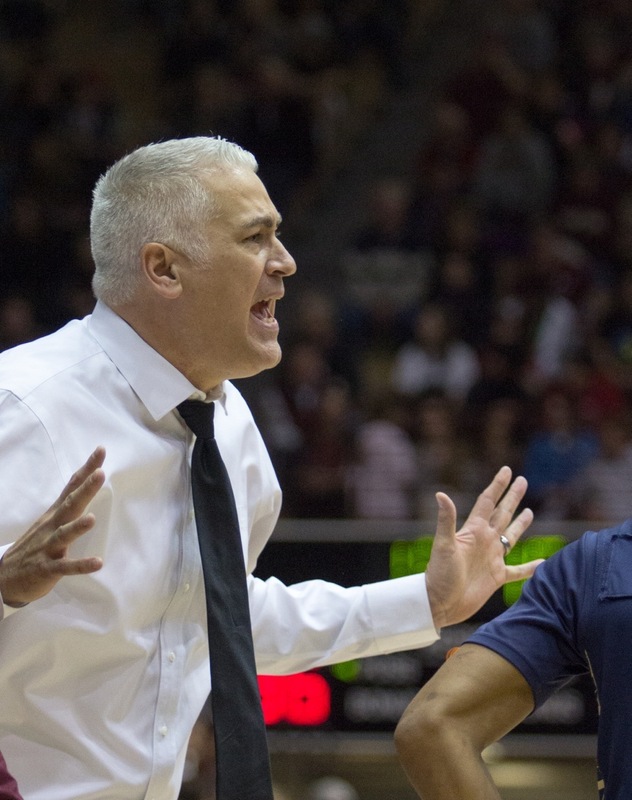 Tinkle – Last night news broke that University of Montana men’s basketball coach Wayne Tinkle would become the new coach at Oregon State. I am so happy for Wayne that he has landed a Pac-12 job. When I was at Montana he always treated me very well. He made campus appearances for me, joked around with me, always said hi to me in the music corner right before games, and congratulated me when I took the Coastal Carolina job. Wayne accomplished tremendous success while in Missoula but it goes deeper than that. He raised three awesome kids that also gave so much to the community. The Tinkles will be deeply missed in the state of Montana. Congrats to Coach Tinkle. The Griz will miss him (photo credit to the legendary Todd Goodrich). 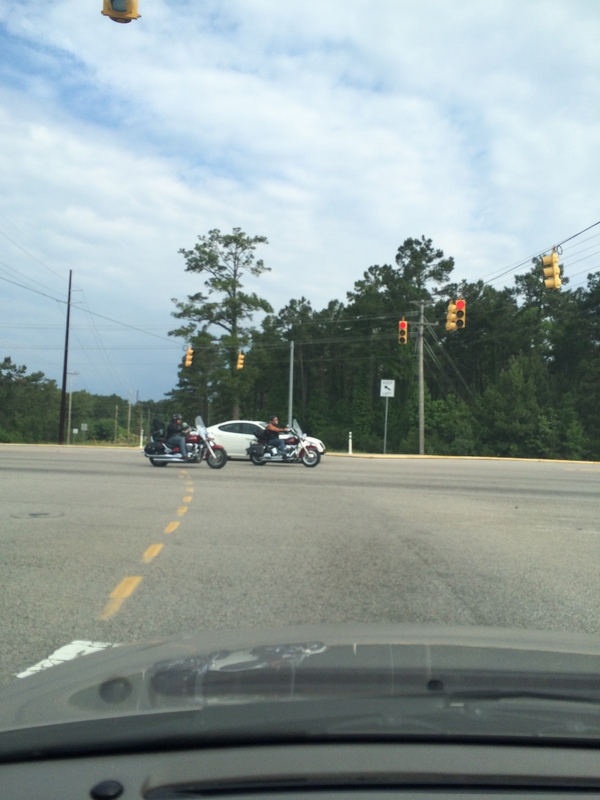 Traffic – In Myrtle Beach you can sometimes run into traffic. Because I get to campus by 6 a.m. each morning I don’t always experience the worst of it but in my three weeks here I have gotten into a couple jams. Today I went out to lunch with Seth Horton, the Sponsorship Director in the Coastal Carolina athletic department. As we came back from Buffalo Wild Wings we got stuck in a little noon time traffic. As we waited for a few minutes Seth put the situation into perspective (I am paraphrasing a little bit): I don’t let the traffic bother me that much because it is made up of people from out of town. They are in the area because they are on vacation. 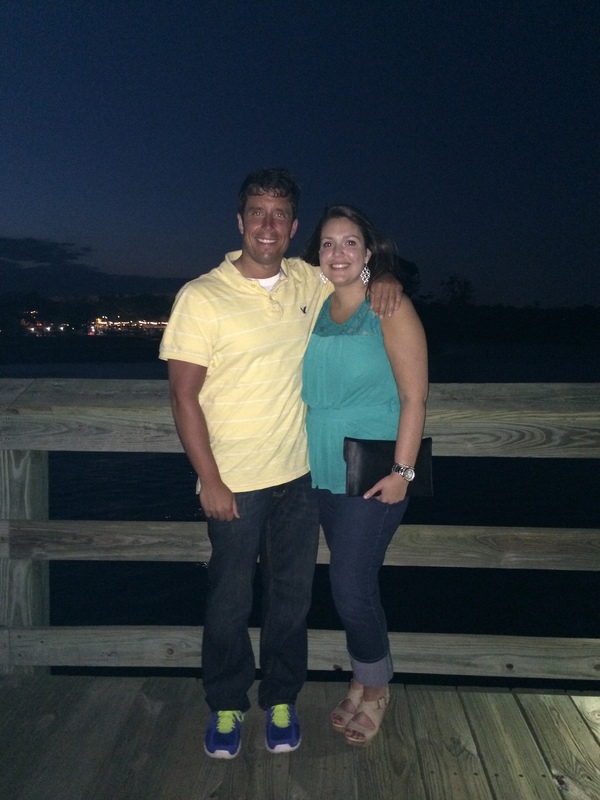 They are choosing to spend their precious time away from the rigors of life in Myrtle Beach. This is our home. People go on vacation where we get to live. I dig it. 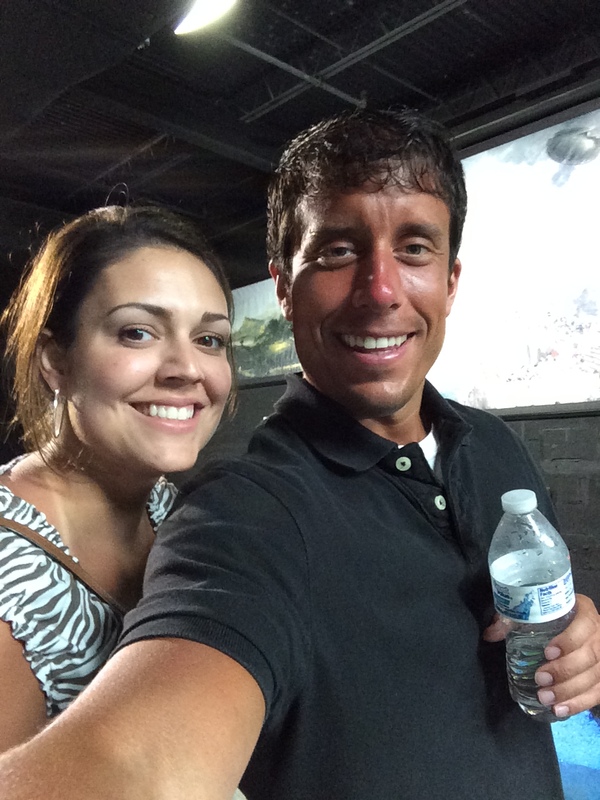 Tan – In Myrtle Beach the sun shines constantly, I have the beach practically in my backyard, and I enjoy an awesome pool complex. It is mid-May and I have started to develop a tan. Numerous people have mentioned my color. I try to warn them from here on out I will only get darker. My Italian heritage enables me to become brown during the summer months. I am making sure to let my co-workers know now so that they don’t think I am a total freak once my shade turns borderline black. As you might be able to tell I am starting to get some color. My friend Sidney and I stand at the Marh Walk at Murrells Inlet this past weekend. Thinking about it, maybe I should have saved this post for Tuesday or Thursday. Oh well, hope you enjoyed the shortness of it. Congrats on conquering Monday, have a great rest of your week. Don’t Blink. When I arrived in Myrtle Beach I was warned about two things. I haven’t felt the draining humidity of the south yet but by arriving at the end of April I set myself up perfectly to experience Myrtle Beach’s infamous Bike Week. First things first, Bike Week really isn’t a week. I noticed the well groomed visitors to the area at the start of last weekend and on my way to church today I saw several participants cruise past me so if you do the math you will figure that the term “week” is used very liberally. Actually this afternoon I saw a marquee that billed the event from May 8 through May 18 so that pretty much ended the discussion…bikers evidently don’t use the American calendar. Secondly, Bike Week is exactly what you think it is. People with motorcycles converge on this resort city for a week (err…10 days) of partying. Think Sturgis but keep in mind this event isn’t just restricted to Harleys. From what I have gathered, the city has mixed feelings about Bike Week. On one hand the participants contribute lots of money to the local economy. On the other hand traffic is a nightmare, not all bikers are well behaved, and the potential for crime and accidents go up. But Myrtle Beach does all it can do to make the best of the situation and proper arrangements and patrols are arranged. A TV/radio/print campaign also takes place reminding both bikers and citizens of the need to respect each other during the week (…I mean 10 days). I respect the bikers. But you know what would make me respect them even more? If they didn’t purposely make as much noise as possible with their bikes. I don’t get the appeal of revving an engine until your ear drums want to bleed. Several times this weekend when I would enter the highway I would be immediately surrounded by bikers in front of me, in back of me, and many times to both sides of me. On a couple of occasions it seemed like all the bikes circling me were gunning for some type of noise decibel record. Yeah, it wasn’t too much fun being on the road. Never took a photo of when I was surrounded by bikers because I had navigation on for my phone but here is a generic picture I snapped today. As I alluded to, immediately upon hitting the streets of Myrtle Beach I would see legions of bikers. 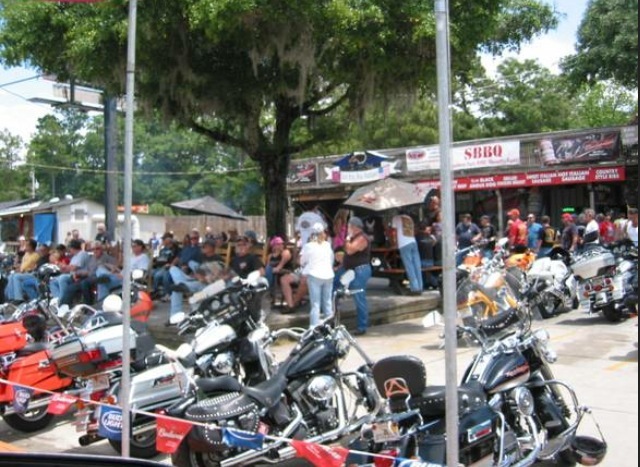 That is really what stuck out to me about Bike Week…just the sheer number of people on motorcycles. They literally take over the roadways. While they do take over the roadways they don’t necessarily take over the whole town. They tend to congregate in certain areas making it nice if you want to make sure to give them their space. While I planned to give them this space last night I walked into their playground for a little bit. Ready to hear the name of the place I found myself in last evening? The Dead Dog Saloon. 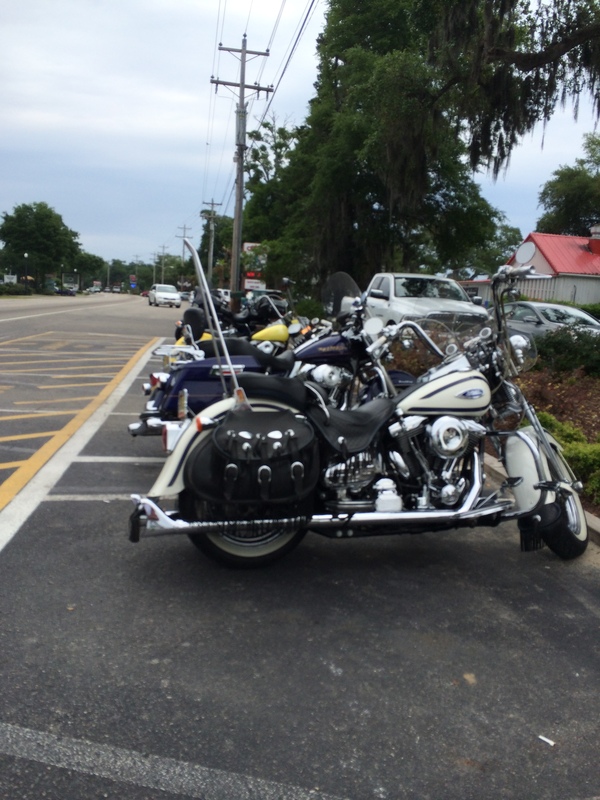 Upon the recommendation of my friend Sidney the two of us went out to Murrels Inlet to rub elbows with the bikers. Well, we didn’t actually rub elbows, we more just observed from a corner table. After walking through a parking lot that was exploding at the seams with bikes jammed packed in every little space we enjoyed dinner while scoping out the week’s honorary residents. Strangely enough it wasn’t the people watching that made the experience so memorable…it was actually the food. I hadn’t enjoyed a tastier steak since when I ate at the Delmonico Steakhouse in Las Vegas. I also got to eat hush puppies for the first time. 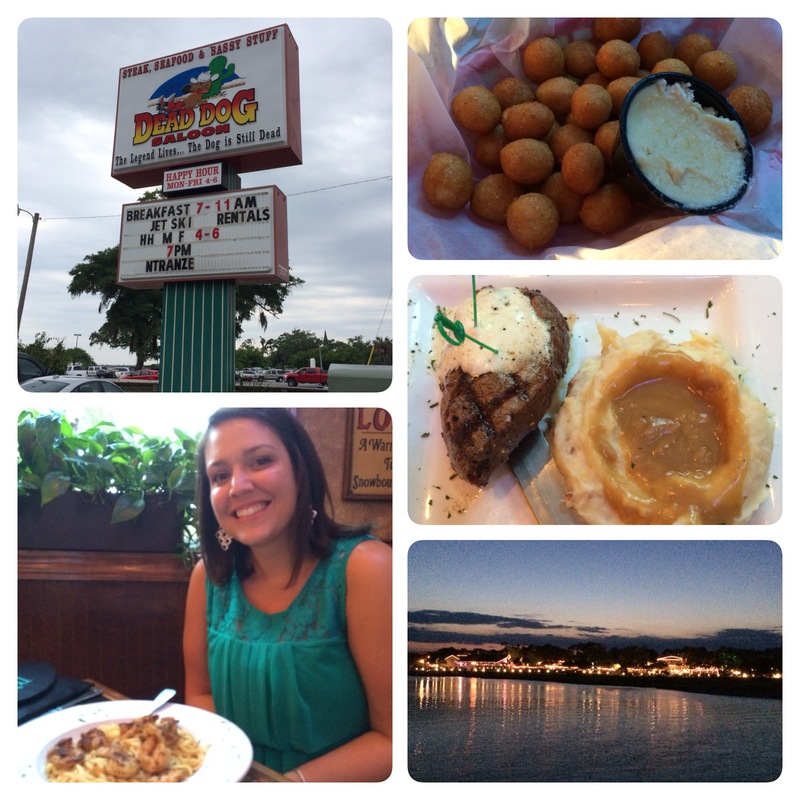 Clockwise: The hush puppies, my amazing steak and mashed potatoes, a view from the Marsh Walk, Sidney and her shrimp pasta, the Dead Dog Saloon sign! Thankfully I didn’t get beat up, singled out, or harassed by any of the bikers. Not that I really thought I would. I joke around but for the most part I understand that many bikers are outstanding citizens who just like to pursue their hobbies like I do mine. I just wish they could keep their bikes quiet. What if I told you that Myrtle Beach will host another Bike Week at the end of this month? It is true. Only this upcoming edition has a different twist to it. I might get to that in a future blog post or I might not. Always wear your helmets bikers and I hope you had a great time in Myrtle Beach. Don’t Blink.